Acaia Lunar Auto Tare and H2O Issues. Please Help. Thread: Acaia Lunar Auto Tare and H2O Issues. Please Help. These scales are 2 weeks old and have never been dropped, dunked or damaged. From the very first few times I used it I was getting the _H2O_ feature showing up(so I removed the plastic film from the display thinking it was that, but it isn't), the display is dry and perfectly clean. When I use the auto tare feature with the triangle and square the auto tare works fine and starts the timer, but it keeps stopping at random times(between 8s-15s), it never goes past 15s without liquid hitting the cup. This does not always allow for the pre infusion time that I want. I have read in the manual that "In all auto start modes, if you do not operate the scale for 30 seconds, it will reset timer and perform tare operation." which it does once the timer stops, but I think it should keep the timer going till it reaches 30s even if the scale hasn't sensed any liquid? Any feedback on this will be greatly appreciated and please let me know if there is any settings in the configuration that may help to resolve this issue? The software is up to date and I've even tried reducing the sensitivity of the scales in case it was a vibration or bump that was stopping the timer. The scale performs the same way no matter what surface I have it on, the little stabilising strips are installed on the base and there is a clear gap around the scales top and base(not catching on the sides). Thank you for watching. Something is definitely not right with that scale. I don't think there is anything you can do but take it back where you bought it, or at least talk to them. It seems to have a touch screen issue, because when you're touching it for it to give the H2O warning it must be getting a touch somewhere else, which it obviously isn't. Cheers for the reply, I thought I was going crazy. I hope it is faulty because it's a disappointing scale if it isn't. Watching the video back it even changed modes without me touching the power button. Yeah I'd take them back. Let's just say mine behave very differently! I hadn't really tried that before. It seems to stop at 10s, unless it gets a bump or other "wobble" in the weight, at which point it stopped at 14s a few times. Tried a total of about 8 times. Seems a bit weird to me. It's too late now to make a coffee (I'm already at 5 shots for the day!) but I'm curious if the vibrations of the machine when the pump is running are enough to keep it from stopping. Maybe it isn't faulty then, it might just not be a great program to use if you have a pre-infusion that is longer than 4-5 secs. I really do appreciate you checking this for me. Though it doesn't explain the weird h2o issues I'm having. Thanks again level3ninja I'm very grateful. No worries, always happy to help, especially when it's that easy! I'd still query it with your supplier though, the H2O thing is weird. I tried it this morning, had the scale of to the side on the stop tray and put another chip in it when I started the shot. Still stopped at 14s. It's weird it would do that on purpose. I've emailed Acaia about this feature, I'll see what they think or if they may even modify the program. Thank you for contacting us. This is something a number of customers have requested and it is in the works for our next Lunar firmware update. I, unfortunately, don't have a timeline for how soon we are rolling out the new firmware. We have a number of projects being completed this fall and we will launch the new Lunar firmware once all of the projects have been completed and released. I hope you have a great week. That's not a bad outcome I wonder what the "projects" they're working on are? I just tested my scale doing the exact same process you did - with the square and triangle. The first cup tare without weight increase stops at 15s. Each tare afterwards will stop at 10s. Hi Brian, thank you so much for the feedback, it is confirmed that the auto tare is meant to occur this way so that's good and now if I can sort out the h2O issue I'll be much happier with the scales. If you just place your scales on a bench do they regularly beep and auto tare? Mine seem to be very unstable? I've had them beep and tare randomly before but I imagine that would be due to holding some water which dripped down into the tray. They're very sensitive but haven't had any issues otherwise. Thank you for the feedback, I had a really weird experience with them tonight. I took the scales to my parents house and used them for an hour or so and not one issue. Could it be possible I've got some kind of interference in my house that's causing some errors? 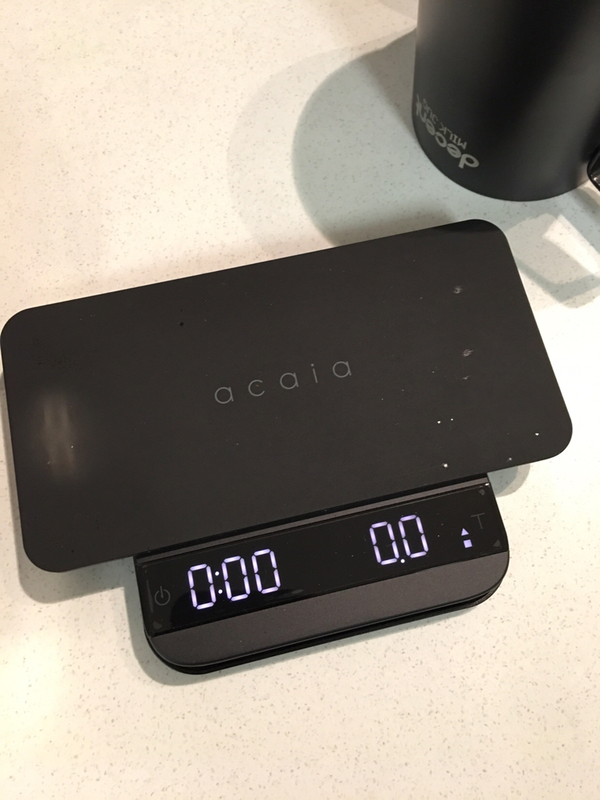 Well great news the Australian supplier replaced my scales the new set arrived today, thanks to a few emails to Acaia tech support they arranged the replacement for me. Shown here with the additional base plate and weighing plate. The initial indications are good, no dramas at all so far.